Some may think that the big show in town this weekend is the Glasgow Warriors against Edinburgh Rugby Guinness PRO14 game at Scotstoun on Saturday night, but earlier in the day there is a rugby festival for youngsters taking place in Edinburgh which is also set to capture the imagination. 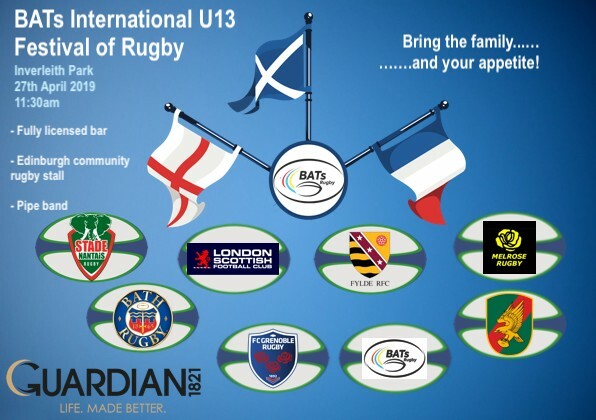 The BATs International under-13 Festival of Rugby has all the makings of a great day in Inverleith Park with the action starting from 11.30am. Joining the host club on a day which will be for all of the family will be other Scottish clubs such as Melrose and Highland while up from down south will be teams from Bath, Fylde and London Scottish. And any day of flair rugby would not be complete without the French and it is great to hear that teams from Grenoble and Stade Nantais will be present. BATs lead development officer Iain Berthinussen said: “This is going to be a great event for the under-13 players and we hope to see as many families and friends down to watch and enjoy the day. “To have teams from England and France at the tournament just shows the strong links that BATS have created with clubs all over the place in recent years and we know that the home players involved really want to put on a good day and want to show their visitors a traditional Scottish welcome. BATs Rugby is based in north Edinburgh and was set up in 2004 by Broughton RFC, Edinburgh Academicals FC and Trinity Accies RFC. The BATs team work across the north Edinburgh community delivering a range of activities designed to increase participation, building skills, great behaviours and lifelong values. The team work with 17 schools to deliver over sessions of physical activity to young people and are involved with organising and coaching teams across all our schools. Within five secondary schools they help build life skills and rugby ability amongst over 200 young people from a range of social and economic backgrounds. They then bring players from the different schools together to play under the BATs banner and the players love to represent the club whilst making friends from different places. The BATs journey does not stop when youngsters hit 18 either though, because Iain and his team help them to navigate the best senior rugby journey for the individual in question. And seeing players like Harry Paterson recently knock over a winning kick for Scotland under-18 against Ireland or Cole Imrie excelling with Edinburgh Accies I just the tip of the BATs iceberg, countless rugby players have been helped by the programme which is growing all the time. “We love what we do and are proud and passionate about what we achieve,” Iain said. Fellow development officer Callum Black said: “When you first go into a school where youngsters have never played rugby before it is always great to see how they enjoy the first session and then it is brilliant to see how that player develops from there. “Seeing people from different backgrounds coming together as part of a team and really working hard together to help each other grow on and off the pitch is also very satisfying.